I met Choman Hardi shortly after she arrived in Edinburgh on Saturday morning. A few hours before the poetry panel on which she was to appear, we found a quiet spot in the Traverse Theatre. Despite her slight weariness from travelling from London, she spoke eloquently and passionately about her work in poetry and activism. Born in southern Kurdistan but forced to flee with her family when she was a young girl, Choman settled in the UK in 1993. A recipient of a Jerwood/Arvon Young Poet’s Apprenticeship among other honours, she is the author of Life For Us (Bloodaxe Books, 2003). You’re here at a Debut Authors Festival, but for you this isn’t a debut the way it is for the other authors – you’ve had books previously published in Kurdish. Could you speak about being a debut author all over again, this time in English? It is a little bit strange at times! Considering that as a poet writing in Kurdish I have established a name within the diaspora and have been interviewed by the Kurdish TV channels a number of times. I started writing poetry about eleven, twelve years ago. I used to write more stories and fiction, but when I began writing poetry I never even thought about English. I was already in England, though, when I started publishing – my first book in Kurdish came out when I was here. No, because it’s in Kurdish. There are a few small diaspora publishers, especially in Scandinavia, because in these smaller countries the Kurdish population is bigger and more active. So my first collection was from a very small publisher – no distribution whatsoever, they just did the books. They took some into a few book expositions and the rest they sent to me. I had to distribute them on my own, because there’s no network for books published in the native languages in diaspora. No libraries would store it, no bookshops would take it. Nobody’s interested in it. It was lucky enough that they had funding to do this anyway – I was very grateful for that, because otherwise nothing would have happened. Anyway… I never really thought of writing in English, and it was only as I stayed here longer I realised … well, at first I tried to translate some of my own work for my friends. I thought, it’s a shame that this is the most important thing in my life, and I can’t share it with some of the closest people to me. It wasn’t very ambitious at all – I just tried to translate it for them, but strangely, it didn’t work. So this was when you were first starting out not just as a writer, but as a poet in particular. That’s right. I was in university, and I had had my first book already published. You know how it is when you’re in university and you live with a group of people whom you see every day, and they’re so important to you – sometimes more than your family and everyone else. I really wanted to share my work with them. A few of them liked literature and wanted to know what I was writing but I found it very difficult. So I kind of left it at that, and later on got my second book out. I was a latecomer to university because I had lost a few years in education due to moving around as a refugee, so my second book came out while I was in university. I faced the same problems but this time I went on a European launch for my second book. I won some funding from college to take my book to different European cities where there were large Kurdish communities and read poetry. I went to Vienna, Stockholm, Berlin and Amsterdam and managed to sell most of the books. I came back to London in 1999, and more and more I realised that there was hardly any Kurdish literature being translated, and not only that, but there’s hardly any awareness of the Kurdish issue. Was this because at that moment in history Kurdish literature wasn’t always allowed to leave its borders, or was there in fact a steady stream flowing into areas in which it could be received and translated and published? Well, there are different reasons. First of all the Kurdish diaspora is quite young. Large scale migration to the West started in the last twenty to thirty years. There are people who have come over in the sixties but there were no communities as such. Also, I think the Kurds have been very much concerned about the loss of their language and culture because of the forced assimilation imposed by the central governments where they live. So writing in western languages or even translating into them was not a priority. The priority was to keep language alive, to keep the identity alive. Writing in the European languages is now becoming more of an option thanks to the new generation. I think both are very important, we need to write in Kurdish but we also need to write in other languages to have more exposure and to exist on the international literary and cultural map. There is plenty of literature written in Kurdish and particularly in the Sorani dialect. This may be partly because in Iraqi Kurdistan we were allowed to read and write in Kurdish, unlike Turkey and to a lesser extent Iran. Fortunately, living under a dictatorship does not means that literature doesn’t flourish. It just takes a different direction. People find their own symbolic way of dealing with it, and creating their own mythological worlds, and making beautiful things. Which reminds me of your poem ‘The Penelopes of my homeland’, the way these myths do get retold and rewritten in times of need. Old myths get retold and reinterpreted and new myths are also created. This is particularly true if you cannot say what you want because of censorship and living under dictatorship. But I also believe that many of those ancient myths are still applicable to us today. We are still living at times where men go to war and women wait for them to return. Which is what Penelope did. The difference between Penelope and the waiting women of my homeland, whom I have compared with her, is that their waiting is futile. Their husbands, unlike Odysseus, will never return. That poem is about the widows of Anfal. There are an estimated number of 50,000 widows from the Anfal campaign in 1988 when thousands of Kurdish villages were destroyed and over a 100,000 villagers ended up in mass graves. Living in the UK I realised that there’s hardly any awareness of the problems facing the Kurds: I still meet people who ask me ‘What’s the difference between Kurdish and Arabic?’ or ‘Why can’t you just settle down in Iraq? What’s your problem?’ That sort of thing. So I have felt responsible that I was in a position to actually write about these things and raise awareness of them. This was one motive for writing in English. Helping this was that I also started reading in English – I was studying in English, did my B.A. and then went on to do an M.A. and a Ph.D., all in English. Most of my friends, even if they’re not English, share English as our common language. What were you reading when you first started out? The first poet I got to know was John Donne. Yes, a friend of mine put me on to him. I remember very well ‘Time will say nothing but I told you so.’ That was the first poem that he read out to me and I thought, wow. Also in my college – I studied at Queen’s College, Oxford – was David Constantine. In my second and third year I organised two art festivals in Queens. This had never happened before and during the second festival in my third year I decided to ask Constantine to take part. I was a little reluctant because I thought, he’s a famous poet and he may not bother to come and speak to students. But he agreed, and I have a video recording of his reading. That was great… But I knew very little, and just found my way reading … not selectively, at all, I didn’t know many people who were big on poetry. Most people read a lot of fiction, you know. So I gradually started writing in English, and it was a slow process. Naturally happening, really. I started writing things that were still in the Kurdish tradition, which brings me back to why I couldn’t translate my poems. It’s not just a matter of language, translating from one language to another, it’s also the different literary tradition that a country, a place, has. Contemporary Kurdish literature is a lot more colourful and playful… it is abstract and surreal, and we express a lot more emotions, we use too many adjectives. These things, you know. These things. Absolutely! You can use four adjectives before you say the thing itself. That’s marvellous. Especially because it’s such a specific marker of a tradition, given that occasionally you run into loose stylistic characterisations like ‘The reserve of the British’ – well, it’s not exactly clear what that means. For you to say ‘We like to use adjectives in Kurdish,’ though, that’s a nice way into the thought of a culture. Well, I must add that this is my impression, other Kurdish poets might disagree with me. But in translating other people’s work I come across this a lot. You can get away with two maximum in English, and that’s it – it’s already too much. And no adverbs, either, right? [laughs] Not really. Another issue is the use of proclamation which is now rather old fashioned in English. Addressing the moon, the light, the ‘O this and that’. I don’t like rules which determine what you can and cannot do in poetry… I mean, yes, with poetry like anything else you can gain skills to do it better. But I don’t like rules, especially strict rules, and I don’t like exclusion. This leads directly into a question I wanted to ask about ‘Life For Us’. As I was reading the book I noticed there wasn’t a single poem in form. Was this a conscious choice? Have you made a policy statement against the sonnet, or…? Well, no, I have actually written my first sonnet just a few days ago. I find them very difficult. Will you tell me about it? Well, they asked me to submit to this new anthology commemorating Ken Saro Wiwa, the Nigerian environmentalist who was killed in 1994. 100 poems to remember him, with themes like survival, resistance, revolution and peaceful fighting and so forth. So I remembered our house – we left in 1988 – which was confiscated. A Ba’athist general lived in it, and he did terrible things like feeding oil to the trees. He really broke the spirit of the house. When we recovered it later it was just four walls, but really damaged. Now my parents have rebuilt it – a two storey, beautiful, glowing house, and the place where he used to dump his waste is now a park, and so forth. He actually died in our house, according to our neighbours. And as I was thinking about this, I thought of how much I wanted him to come back and see ‘You thought you’d managed to control everything, but look, yes, you destroyed a little house and now there’s a castle in its place.’ I wanted to show him that you can’t stop life. So the first eight lines were about ‘You did this, you did that,’ the house, you know. And then the next six were about ‘If you came back,’ you know, a change of tone. Sounds dangerously like a sonnet to me. Do you have any plans to write any more? Is this the beginning of a long and torrid affair with sonnets? What was your take on the sestina? I thought it was a form for nightmarish, repetitive, compulsive thoughts. It’s not for all poems. [laughs] I’ve done one. It was just to tick that box. I don’t know, though. I think being so bound by these words really is obsessive-compulsive. True, but you don’t have to follow the rules to the letter. There are just as many variations on the sestina as there are ‘vanilla’ sestinas – half the fun is breaking the rules and doing something no one’s done before, like Miller Williams’ marvellous ‘The Lonesome Shrinking Sestina’, or many of the ones you see appearing on McSweeney’s these days. It really is for the poem to decide, isn’t it? I’m not going to impose it on a poem. I did once – I thought that the form worked but the content wasn’t that good, and like with the sonnet it just kind of happened naturally. It was meant to be, in a way, instead of sitting down and saying ‘Okay, now I’m going to write a sonnet.’ That’s when you may end up with the form separate from the content. Which is dangerous, because then you’re sitting down to write a poem. Let me ask you a little more about the book. Family seems to be extremely important in the poems – your father was a well-known Kurdish poet. Did you get much of your inspiration from him? A great number of the poems highlight individual members of your family, often in association with a particular place – I’m thinking particularly of a poem like ‘My Mother’s Hands.’ Has this always been the case, in your Kurdish work as well as your work in English? Family has always been present in my poems, even in my first book – even though I would consider my first book mostly love poems. I think I used to write a lot of love poetry because things weren’t going well, and now that I’m happier I can write about other things. But there were always whispers and words from my mother infiltrating the poems. But I guess that’s just … well, I come from a large family, I’m the last child of seven, and we’d been through a lot together. I owe a lot to my family. It’s boring to say you love your family, of course, but once you’re separated from them it means a lot more to you. My closest brother in age is also one of my best friends. He’s eight years older than me, and throughout my life I have had moments where I’ve been very angry or annoyed or confused about something, and I’ve talked to him and felt better. For example, I was recently at this writer’s retreat in the United States, a program called ‘Women Writers of the Arab World.’ At first I didn’t want to go, because I’m from Kurdistan and I don’t want Kurdistan to be part of the Arab world. On the other hand, Kurdistan doesn’t exist, we’re part of Iraqi Kurdistan, and Iraq is considered part of the Arab world. Exactly, although that was a Turkish border guard. Normally, people who know where it is say that just to annoy you. So one day about a year and a half ago they asked me if I wanted to come, and at first I decided not to. Then they asked me again, I think they wanted me to represent one of the minorities in the Arab world – because the Arab world includes places like Sudan and Somalia where some of the people don’t even speak Arabic. Anyway, I think the organisers wanted Iraq, what with a Kurdish president and so on. So I decided to go and I’d been very nervous, thinking I’m going to have a lot of arguments with these women because there’s a history of conflict and of silence. 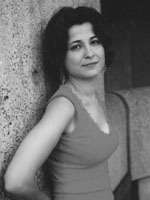 All of the other women were Arab women writers, and I was the only Kurdish woman. I was a minority. My brother said to me – and he’s been saying this to me for the past six months, and I think it’s very useful – he said ‘Just remember, you become friends, and then you argue. You don’t argue and then become friends.’ You have to establish a friendship first before you can tell them what you think. I think this was extremely helpful because there were many things I refrained from saying in the first two weeks, but was able to share with them later on once we had developed that kind of friendship. So this was very important advice from my brother, and from across the ocean, too. He lives so far away – he’s still back home – and for years there wasn’t even a telephone. Only recently, in the past four-five years, is there a telephone. There’s still no post, though. Would you speak a little about your experience of the past three years, witnessing the American intervention? I wanted Saddam Hussein to be removed. I believe that there was no other choice but outside intervention, but I believe it needed a lot of planning and preparing, protecting the borders, putting up security, making sure the looting doesn’t go on and making sure that these terrorists don’t cross the border and get through … Many other things which went, as usual, un-thought of. And it was done, again, the Hollywood way – even in the first Gulf War, I remember their saying it would be a 100-hour intervention. Come on! This is reality. You don’t determine how many hours you’re going to be at war before it happens. My father always said that the only thing you control in war is the first shot. And sometimes you can’t even control that. Exactly. You don’t know how it’s going to go. I was also angry about … well, my position was in between. I wanted Hussein to be removed but I didn’t want it done this way. I was annoyed about the American and British administrations for not being honest. The war wasn’t about what they said it was about. I felt there was a good moral argument for the war but that argument was not their reason for going to war. If they were concerned about the Kurdish people, or Iraqi people in general, they would have done this many years ago, in 1991. I was also angry with the public, because I thought ‘All these suddenly mobilised people shouting anti-war slogans, not wanting anyone to be killed – where were they when we were being killed?’ And thousands of us were being killed. Some of those events were covered here. I have gone to the Guardian archives, and Halabja was covered. Nothing was done about it. It was just a passing thing. America doesn’t have the most exemplary record of late in responding to these sorts of crises. Take, for instance, Nicholas Kristof’s recent reports in the New York Times on Darfur, and Bush’s reaction to the genocide being committed there. Nothing is happening. Not a thing. Nothing happens. I’m reading about genocide at the moment. Did you know that when you label a case as genocide, you’re required by law to intervene? I guess most countries don’t want to get there. Is this by the Geneva Conventions? It is the United Nations Genocide Convention, if you recognise a case as genocide you are meant to indict the government. You’re meant to intervene. You have been back to Iraq since the deposition of Saddam, haven’t you. Two years ago, in June. Just after the war. Oh, it was wonderful. The Kurdish region is reasonably safe, except for recently there were a couple of suicide bombers. And we’ve had twelve, thirteen years of Kurdish regional government, because after the first Gulf War there was the no-fly zone to protect the Kurds and then the Kurdish regional parliament was set up. There’s infrastructure in place: police, traffic, offices, schools, drainages, whatever. And there have been many women’s organisations that have achieved a lot – they’ve managed to get the Kurdish regional government to change some articles in the Iraqi penal court with regards to women. Polygamy, the right of inheritance, the right of ‘Man doesn’t get away with honour killing so lightly as he used to before.’ So a lot has been achieved. One of the poems in the book is about ‘the greening mountains.’ In the eighties they burned down all the Kurdish forests, and when I went home I saw all these trees growing back, exactly the same as with our house. Things are thriving again. You work with this organisation called Exiled Writers’ Ink!, which is an advocacy group for bringing writers in diaspora together and making sure that silenced voices are heard. To what extent has your involvement with this organisation changed (or not) with the current political situation in Iraq? Well, this organisation was set up by Jennifer Langer; her parents were refugees from Nazi Germany. She had this language which was not passed on to her – German – and she taught English as a second language. Through her teaching she met a lot of refugee students, and she thought, instead of teaching them our material, why don’t we get them to study literature by their own writers in English? That would be more interesting, more motivating, for them. So she went around to community centres and refugee organisations, asking them if they knew any writers – Arabic, Kurdish, Indian, Mexican, African, and so forth. After being introduced to these writers, she realised there were plenty of writers who were very well established in their own languages, but nobody knew them here. So she did this anthology and after that called a meeting, and the meeting led to this organisation, and from the early days I was involved in it. When was all this taking place? It became an established organisation in 2000. But before that Jennifer was doing a lot of other work with refugee writers anyway. I don’t know, though … I have many projects to go back to Kurdistan for. My main project, which is part of what I’m doing for my post-doc, is to gain international recognition for Anfal as a genocide. What I’m hoping to do is to set up an organisation that would help collect data about survivors and victims, the numbers, the dates, the people, places … about 3000-4000 Kurdish villages were destroyed in 1988, and there is hardly any information about it. There are two reports, by Human Rights Watch, but in English nothing else exists about the survivors – the women, the children. The children ended up not going to school, because they had to work. There were no male breadwinners. So my research is to do with seeing how life has been for this group, the widows whom I have called ‘The Penelopes of my homeland’, and also to make sure there is an organisation that makes this public in English. A campaign. Interestingly, I’m experiencing the same thing that my father experienced, which is that he became less and less involved in poetry as he got more and more involved in politics. I’m not getting involved in politics as such, but I think there is a lot of campaigning for me to do. And there are many burning issues at the moment. For example, Kirkuk, the Arabised city of oil. There are 300,000 Kurdish people who are waiting to return to their homes, and there are the Arab settlers who should be compensated. I think it’s a similar situation to Jewish settlements in Palestinian cities that should be dismantled – but lawfully, of course. There are so many things that nobody else is taking on. It has to be the Kurdish people themselves. There aren’t many of us who are fluent in both cultures and languages, who are able to do this. So I feel that part of me is pulling towards that direction: campaigning and activism and so forth. Writing is parallel to that, but it’s not the same thing. It seems like your travels – both physical and mental – in those areas would serve to occasion a lot of recollection and reminiscence. I don’t mean to presume here, but if memory is the province of the poets, as Cynthia Ozick put it recently, moving from poetry to politics is to move, in a sense, not at all. Yes, part of me thinks the same. For example, I think that research and academic writing is just another form of writing, really. You’re still producing creatively. Speaking of creative production – would you speak about the way you organise your books, how you pull poems together? You have your bacon, your lettuce, your tomato – how do you make a sandwich out of that? Titles I find very difficult. Certain things start with a title. There was this one poem, ‘Pyjamas, 1983′, which was a title I carried in my head for months. I knew it had to be about that year: when my brother was arrested, when the students demonstrated, about the pyjamas people gave out. I knew it would be called that, but I didn’t know how to write it. It’s very difficult to write about such situations creatively. I thought about it and thought about it, and then suddenly it just crystallised. But there are other poems that really don’t want to be named, don’t want to be pinned down. Because they have loads of other dimensions to them. Sometimes I spend a lot of time deciding. With some of the poems, though, there is definitely a thread going through them. The link is the father or mother, and so on. Other poems … you read certain books of poetry and it feels like between every poem and the next one there’s such a huge gap. I was in a workshop by Jane Duran and she said ‘Let’s write a poem in that gap. What is going on from this poem to the other?’ And that stayed with me a lot, as I was ordering the poems in Life For Us. I also had great help from George Szirtes who was my mentor for that period and helped me shape up the book. As a result, there are poems between poems, and stories untold between poems, and I tried to respect that order. The book is, I believe, very much a personal concrete journey: starting from exile, going back to childhood memory and family, returning again, and going on to more personal poems. Mixed marriage, future children, and so forth. This does comes across when you read the book. There is a temporal development that I found very prevalent..
One last question. Your biographical statement in the book mentions you’re an artist. Would you speak a little about your nonverbal artistic work? Yes, but I haven’t been painting for the past few years. I started as a child, wanting to be an artist – I always painted, and I did art A-level and thought about doing a fine arts degree. But then I thought ‘You can be an artist without studying it.’ Big mistake. You can’t do everything – this is the problem. At this point in my life I feel as though I’m being pulled in too many directions. I have my family, my research, my poetry … I’m trying out fiction at the moment. There is only so much that you can take on at certain times. I think of art as something I can return to when I have children, when I have to stay at home and can’t travel so much. When you can’t come to writer’s festivals. Exactly! [laughs] Stay at home, tranquil, and paint. I love painting. I prefer painting to drawing, I love the human form, and I love colours. Such as in your poem ‘What Colour?’, which is very much attuned to the different shades and hues that take place in emotions, ending with that neutral brown. That’s interesting you should mention that one. Initially it ended ‘I must learn to be more white.’ And white for me means patience. I showed it to someone and they said, well, the connotation of race … that’s the problem sometimes, with writing in another language. Each language has its own baggage, and certain words are tinged with certain emotions. As a newcomer to the language you’re not necessarily familiar with the psychology and the history that goes behind each word. So sometimes, accidentally, you pick the wrong word. You have blind spots. Anyway, I actually had to change that to brown because brown is the colour of earth, and the patience the earth takes to sprout things. The language in the poems is striking in the way that it’s so measured and plainspoken. At the same time, it was so interesting to hear you mention that you started by reading Donne – if I had heard that before reading the book, I might have thought to look for tricks and wordplay and linguistic mischief and so forth. Rather, what you get is a wonderfully evocative series of moments – sometimes, as with ‘Lausanne, 1923′, just one moment. I thought about that poem for a long time. I read the Treaty of Lausanne, and the Treaty of Sèvres, which was the one from a few years before. The Treaty of Sèvres was supposed to give us a Kurdish state as well as an Armenian state, but that never materialised because the Treaty of Lausanne came so soon afterwards. And I thought, how amazing, because that moment – when a few British and French sat down and decided, it just didn’t occur how complex their decisions would make life for what is now over thirty-five million people. And the simplicity of the moment. It was just like that. Very short, not even any second doubts. Sit down, draw lines, done. Sometimes I try to reflect in the language and in the form and in the length, the situation itself. Other times the plainspoken language you mention is to contrast with the complexity, the horror and the pain of the moment. Passionate and complex language may not suite the poems in the book. When I started writing in English I wrote a lot of angry poetry, emotional poetry. I never published it, because I think there is a difference between emotional poetry and poetry informed by emotion. I would very much like to write the latter but not the former. If somebody is shouting in your face, even if they have a point, you’re less likely to listen to them. Tranquillity and simplicity: sometimes they bring the horrors back better. Life For Us is available from Bloodaxe Books (£7.95 PBK, ISBN 1852246448). 2 Comments on "Choman Hardi Interview"